IL-15 is a key component that regulates the development and homeostasis of NK cells and is delivered through a mechanism termed trans-presentation. During development, multiple events must proceed to generate a functional mature population of NK cells that are vital for tumor and viral immunity. Nevertheless, how IL-15 regulates these various events and more importantly what cells provide IL-15 to NK cells to drive these events is unclear. It is known dendritic cells (DC) can activate NK cells via IL-15 trans-presentation; however, the ability of DC to use IL-15 trans-presentation to promote the development and homeostatic maintenance of NK cell has not been established. In this current study, we show that IL-15 trans-presentation solely by CD11c+ cells assists the in vivo development and maintenance of NK cells. More specifically, DC-mediated IL-15 trans-presentation drove the differentiation of NK cells, which included the up-regulation of the activating and inhibitory Ly49 receptors. 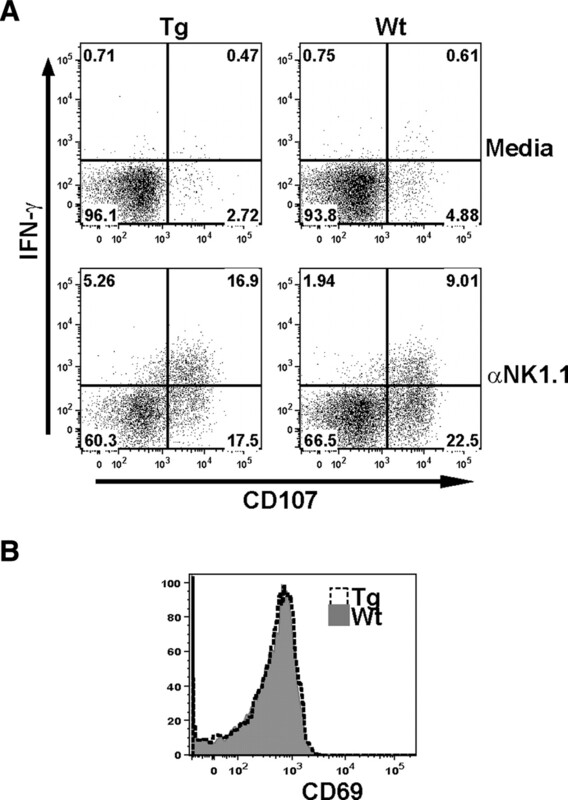 Although these cells did not harbor a mature CD11bhigh phenotype, they were capable of degranulating and producing IFN-γ upon stimulation similar to wild-type NK cells. In addition, DC facilitated the survival of mature NK cells via IL-15 trans-presentation in the periphery. Thus, an additional role for NK-DC interactions has been identified whereby DC support the developmental and homeostatic niche of NK cells. The functional plasticity of NK cells in tumor and viral immunity has revealed their significance as instrumental lymphocytes in the innate immune system (1, 2, 3). Thus, NK cell development is of great importance for host immunoprotection. Several groups have deciphered the multistage events that murine NK cells undergo to become functional mature lymphocytes (4, 5). The earliest stage of NK cell commitment are noted as NK precursors (NKp),4 which are negative for known murine NK markers, such as NKR-P1C (NK1.1) and Ly49 receptors, but express IL-15Rβ (CD122) (6). Transition from NKp to immature NK cells is marked by the expression of NK1.1 and CD94/NKG2, followed by the stochastic expression of various activating and inhibitory Ly49 receptors. Mature NK cells are distinguished from immature cells by the expression of CD49b (DX5) and by the capacity to kill and produce proinflammatory cytokines (4, 7). These functional attributes are enhanced with the up-regulation of CD11b and CD43. Within this differentiation process, there exist other developmental events such as proliferation and NK cell “licensing” (also referred to as “disarming”) (8, 9). Licensing is the process that leads to the generation of functionally mature albeit self-tolerant NK cells and is achieved upon interactions between Ly49 inhibitory receptors and corresponding classical MHC class Ia ligands; however, the exact stage of development where licensing occurs is uncertain (8, 9). Most of these developmental events occur in the bone marrow (BM) (5, 10); however, cells displaying a precursor or immature phenotype can be found in the spleen and liver, indicating that development occurs in situ and/or developmental intermediates may migrate to those sites (5). Regardless of the tissue site, the events driving the development of NK cells are not well defined. A better understanding of this developmental process will provide a clearer picture of how innate immunity is achieved and may be used to exploit the innate immune system for therapeutic recovery or can be facilitated to enhance NK cell production in hemopoietic stem cell transplantation. Multiple studies have revealed a crucial role for IL-15 in NK cell development and homeostasis. IL-15 uses three receptor subunits consisting of the unique IL-15Rα, the shared IL-15Rβ, and the common γ chain (11). The absence of IL-15 or any of these receptor subunits results in a deficiency in NK cells, which highlights the importance of each in the development of NK cells (12, 13, 14, 15). A unique characteristic of IL-15 and its specific receptor IL-15Rα is the ability to stimulate neighboring cells via a mechanism referred to as “trans-presentation” (16, 17). Trans-presentation is a means of cytokine delivery whereby IL-15, complexed to IL-15Rα, is presented to adjacent IL-15-responsive cells expressing IL-15Rβ and common γ chain subunits. The finding that IL-15Rα expression by NK cells is not required for its homeostatic proliferation or survival supports the mechanism of IL-15 trans-presentation as the major mode of action in vivo (18, 19, 20, 21). Since trans-presentation is established as a major mechanism of IL-15 delivery, then identifying the “trans-presenting” cell type(s) will enhance our understanding of how NK cell development is regulated. Because radiation-resistant BM stromal cells express IL-15 transcripts, it has long been suggested these cells are a major cell type providing IL-15 to developing NK cells (15, 18). Additionally, Schluns et al. (22) revealed expression of IL-15 and IL-15Rα+ by hemopoietic cells rather than radiation-resistant cells was more important in generating NK cells; however, both cell types could partially support some NK cell development. These findings suggest that different cell compartments may have distinct roles in NK cell development. Furthermore, since developmental intermediates are found in the spleen and liver, it is possible that cells trans-presenting IL-15 are tissue site specific. In addition to its role in development, IL-15Rα expressed by hemopoietic cells also plays a major role in the homeostatic maintenance of mature NK cells (19, 21). Such maintenance is mediated by IL-15-driven expression of antiapoptotic molecules Bcl-2 and Mcl-1 and the down-regulation of proapoptotic molecules, Bim and Noxa (18, 23, 24, 25, 26, 27). Dendritic cells (DC) are versatile hemopoietic cells that express both IL-15 and IL-15Rα and can activate mature NK cells via IL-15 trans-presentation (28, 29, 30). Whether DC can also trans-present IL-15 for NK cell development and homeostatic maintenance is not clear. In this article, we investigate whether DC promote the development and homeostasis of NK cells via IL-15 trans-presentation by using a model wherein CD11c+ DC subsets are the sole cell-type trans-presenting IL-15 (31). By using this model, we provide evidence that DC contribute to the development and homeostatic maintenance of NK cells via IL-15 trans-presentation. In addition, we have identified specific stages of NK ontogeny in which IL-15 trans-presentation functions under steady-state conditions. Overall, an additional role for NK-DC interactions has been identified whereby DC support the developmental and homeostatic niche of NK cells in a tissue-specific manner. C57BL/6J (CD45.1 and CD45.2) mice were purchased from The Jackson Laboratory and the National Cancer Institute. IL-15Rα−/− mice were generously provided by A. Ma (12) (University of California San Francisco) and backcrossed to C57BL/6 mice 15 generations. CD11c/IL-15Rα transgenic (Tg) mice were generated in our laboratory and described elsewhere (31). Tg founder line no. 1, backcrossed to the IL-15Rα−/− background, was used throughout this study. Tg-positive mice were identified by PCR of tail DNA and confirmed by IL-15Rα staining on CD11c+ cells. Mice were 6–10 wk of age when used in experiments. All mice were maintained under specific pathogen-free conditions at the University of Texas M.D. Anderson Cancer Center in accordance with the Institutional Animal Care and Use Committee guidelines. Spleens were homogenized in HBSS containing HEPES, l-glutamine, gentamicin, and pen-strep (HGPG) using frosted slides. Livers were collected after intracardiac perfusion with PBS containing heparin, minced, and digested in RPMI 1640 with 10% FBS and 150 U/ml collagenase (Invitrogen). Remaining tissue was pressed through a 70-mm cell strainer, and lymphocytes were isolated with a 44–67% Percoll (Amersham Biosciences) gradient. BM cells were isolated by flushing a femur and tibia with HBSS/HGPG and filtering through a 70-μm nitex. NK cells were stained with the indicated Abs obtained from BD Biosciences (CD3 (17A2)-FITC, CD122-PE, NK1.1-PerCP-Cy5.5, CD11b-PE-Cy7, CD49b (DX5)-PE, Ly5.2 (CD45.1)-PE, CD94-PE, and CD69-Pe-Cy7) or eBioscience (Ly49 C/I/F/H-FITC, Ly49 G2 (4D11)-FITC, Ly49 I (YLI-90)-PE, Ly49 A/D-PE, CD49b (DX5) allophycocyanin, KLRG1 allophycocyanin, NKG2D (CD314) allophycocyanin, Ly49 H (3D10)-AlexaFluor 647, CD107a (1D4B)-AlexaFluor 647, and NKG2 A/C/E (20d5)-biotin) and Biolegend (Ly49 A PB, CD43 allophycocyanin and TCRβ allophycocyanin AlexFluor 750). All samples were collected on a LSR II Flow Cytometry (BD Biosciences), and data were analyzed with FlowJo software (Tree Star). BM was collected from the tibia and femurs of IL-15Rα−/− (CD45.1 or CD45.1/CD45.2) and C57BL/6J (CD45.1) mice by crushing with mortal and pestle. T cells were removed from the isolated BM cells by treating with anti-Thy1 mAb (30 H12), followed by the incubation of Low-Tox-M rabbit complement (Cedarlane Laboratories) for 1 h at 37°C. IL-15Rα−/− (CD45.2) and C57BL/6J (CD45.2) recipients were irradiated with 1000 cGy and injected i.v. with 3 × 106 BM cells. In some experiments, BM cells from IL-15Rα−/− (CD45.1/CD45.2) and C57BL/6J (CD45.2) were mixed in equal proportions before injecting into irradiated C57BL/6J (CD45.1) recipients. Chimera mice were analyzed for the presence of donor NK cells in the BM, liver, and spleen 8–12 wk later after complete BM reconstitution. For long-term labeling, mice were administered water supplemented with BrdU (0.8 mg/ml). BrdU-supplemented water was changed every 2 days for 3–4 wk. BrdU Flow kit (BD Pharmingen) and protocol were used to analyze NK cell incorporation of BrdU. Cell surface stains included markers to identify individual development stages for NK cells. Cells were then fixed and permeabilized using BD cytofix/cytoperm buffer, followed by DNase (30 μg) treatment. Cells were then stained with anti-BrdU FITC for 20 min at room temperature and analyzed as stated above. To enrich for NK cells, 10–15 spleens were pooled from C57BL/6J (CD45.1) mice and incubated with rat anti-CD8 (2.43), anti-CD4 (Gk1.5), anti-CD19 (1D3), and anti-MHC II (M5), followed by washing and a subsequent incubation with goat anti-rat Dynabeads (Dynal Biotech). Magnetic-coated cells were then removed with a magnet. Enriched cells were CFSE-labeled, and 7–10 × 106 cells were injected i.v. into IL-15Rα−/− (CD45.2), CD11c/IL-15Rα Tg (CD45.2), and C57BL/6J (CD45.2) mice. Three weeks later, mice were sacrificed, the BM, liver, and spleen were harvested, and donor cells were analyzed for cell surface phenotype and cellular division by flow cytometry. Spleens from four to five CD11c/IL-15Rα or wild type (Wt) were pooled and enriched for NK cells as previously described above. Enriched cells were stained with CD3, NK1.1, Ly49 C/I/F/H, and Ly49 A/D and then sorted on the FACSAria II cell sorter (BD Biosciences). Sorted population contained a NK1.1+Ly49−CD3− cells, which were used for coculturing with C57BL/6J and IL-15Rα−/− DC. DC derived from C57BL/6J and IL-15Rα−/− mice were generated by culturing BM-derived cells with GM-CSF at 1000 U/ml supplemented complete media (RPMI 1640, 10% heat-inactivated FCS, 10 mM HEPES, and 50 μM 2-ME). Cells were washed and fed every 2 days for 7 days. BM-derived DC were then collected and cocultured at a 1:3 ratio with NK cells negative for Ly49 C/I/F/H and A/D. After 5 days, NK cells were then stained for CD3, NK1.1, Ly49 C/I/F/H, and Ly49 A/D cell surface markers and analyzed by flow cytometry as described previously. Spleens from four to five CD11c/IL-15Rα or Wt were pooled, enriched for NK cells as previously described above. NK1.1+CD3− cells were sorted from the enriched fraction on the FACSAria II cell sorter (BD Biosciences) and incubated for 5 h in the absence or presence of plate-bound anti-NK1.1 Ab at 37°C as described previously (8). Cultures were supplemented with 1 μl of CD107a (1D4B) Ab and 1 μl of GolgiPlug (BD Biosciences) as described previously (32). The cells were then fixed and permeabilized using BD Cytofix/Cytoperm buffers and stained with PE-conjugated anti-IFN-γ or control Ig mAb (BD Biosciences) as well as CD3 and NK1.1 and analyzed via flow cytometry. Graphs generated display the mean ± SEM, which were obtained by performing one-way ANOVA using GraphPad Prism software (GraphPad Software). To evaluate the contribution of DC-mediated IL-15 trans-presentation in the generation of NK cells, we examined the recovery of NK cells in CD11c/IL-15Rα Tg mice bred on the IL-15Rα−/− background (31). Since NK cells develop in the BM and are abundant in the liver and spleen, each of these tissues were analyzed in the CD11c/IL-15Rα Tg mice and compared with IL-15Rα−/− and Wt (C57BL/6) mice for total NK1.1+CD3− cells. In each of these tissues, the frequency and total numbers of NK cells were significantly increased in the CD11c/IL-15Rα Tg mice compared with IL-15Rα−/− levels, with the recovery being most dramatic in the BM (Fig. 1⇓). These data reveal reconstitution of IL-15Rα solely to the DC compartment contributes to the generation of total NK cell (NK1.1+CD3−) numbers. ), and B6 (□) mice were calculated (average of three independent experiments, n = 7 mice/group). Error bars represent SE; *, p ≤ 0.05. Numbers above bars represent percentage of Wt levels. Because NK cell development involves the transition through multiple stages to become a mature NK cell (4, 5), the next step was to identify the stages of development regulated by DC. This was accomplished by quantitating the following transitional subsets using differential expression of cell surface markers: NK precursors (CD122+NK1.1−DX5−CD3−), immature (CD122+NK1.1+DX5−CD3−), early mature [M1] (CD122+NK1.1+DX5+CD11blowCD3−), and late mature [M2] (CD122+NK1.1+DX5+CD11bhighCD3−) NK cells (Fig. 2⇓A). In all tissues examined, the complete absence of IL-15Rα resulted in a dramatic decrease in the number of both mature (M1 and M2) NK cell subsets, a moderate defect in immature NK cells but no deficiencies in NK precursors (Fig. 2⇓B). Within the BM and spleen, IL-15 trans-presentation by DC was very efficient in restoring immature NK cells and partially restored the early and late maturation stages when compared with the IL-15Rα−/− mice (Fig. 2⇓B). 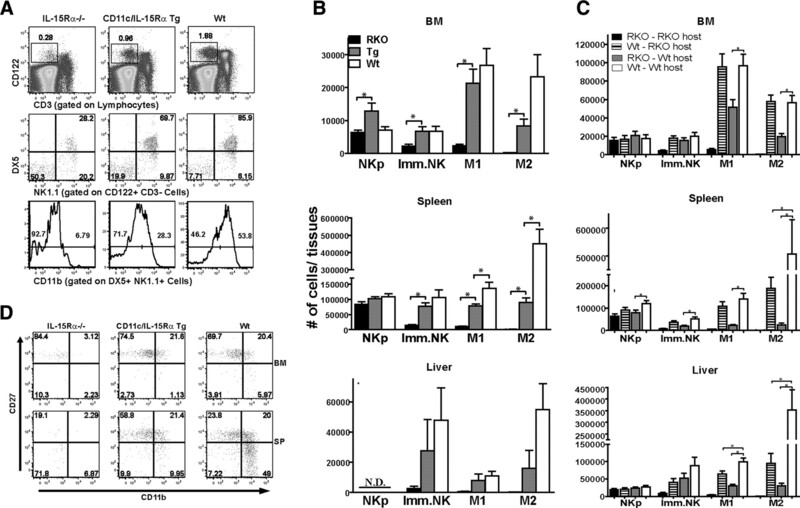 Similar to the BM and spleen, the presence of IL-15Rα+ cells in the liver also enhanced the development of immature and mature NK cells but was most effective in recovering the M1 stage compared with Wt mice (Fig. 2⇓B). Recovered developmental stages and tissue distribution of NK cells by DC-mediated IL-15 trans-presentation. A–D, Stages of NK cell development were identified by flow cytometric analysis of BM, spleen, and liver isolated from each group of mice (IL-15Rα−/−, CD11c/IL-15Rα Tg, and Wt mice). Representative flow cytometry data from the BM are shown in A. NK precursors are characterized as CD122+NK1.1− cells; immature are CD122+NK1.1+DX5−; early mature (M1) display CD122+NK1.1+DX5+CD11blow phenotype; and late mature (M2) are a CD122+NK1.1+DX5+CD11bhigh population. B, Absolute numbers of NK cells at the various developmental stages in the respective tissues (average of three independent experiments, n = 7 mice/group) in the indicated groups. C, Lymphocytes were isolated from the indicated tissues of IL-15Rα−/− BM chimeras 8–12 wk after irradiation and BM reconstitution. Numbers of NK cells at the various developmental stages in the respective tissues of IL-15Rα−/− BM chimeras are shown (average of three independent experiments, n = 8 mice/group). Error bars represent SE; *, p ≤ 0.05. D, NK cell subsets distinguished by their cell surface expression of CD27 and CD11b in the BM (top row) and spleen (bottom row) from each group of mice. Flow cytometric plots are representative of three independent experiments (n = 7 for each group of mice). To determine how the effect of IL-15Rα restricted to CD11c+ cells compares to the effect of IL-15Rα is expressed by all hemopoietic cells, recovery of the different stages of NK cell development was analyzed in various IL-15Rα BM chimeras. When IL-15Rα expression was restricted to hemopoietic cells (Wt BM→IL-15Rα−/− chimeras), the development of NK cells at all stages was completely recovered in the BM as compared with Wt BM→Wt chimeras (Fig. 2⇑C). Since this level of recovery is not observed in CD11c/IL-15α Tg mice at the M1 and M2 stages, it indicates that other non-CD11c− hemopoietic cells are essential at the late stages of NK cell differentiation (Fig. 2⇑C). 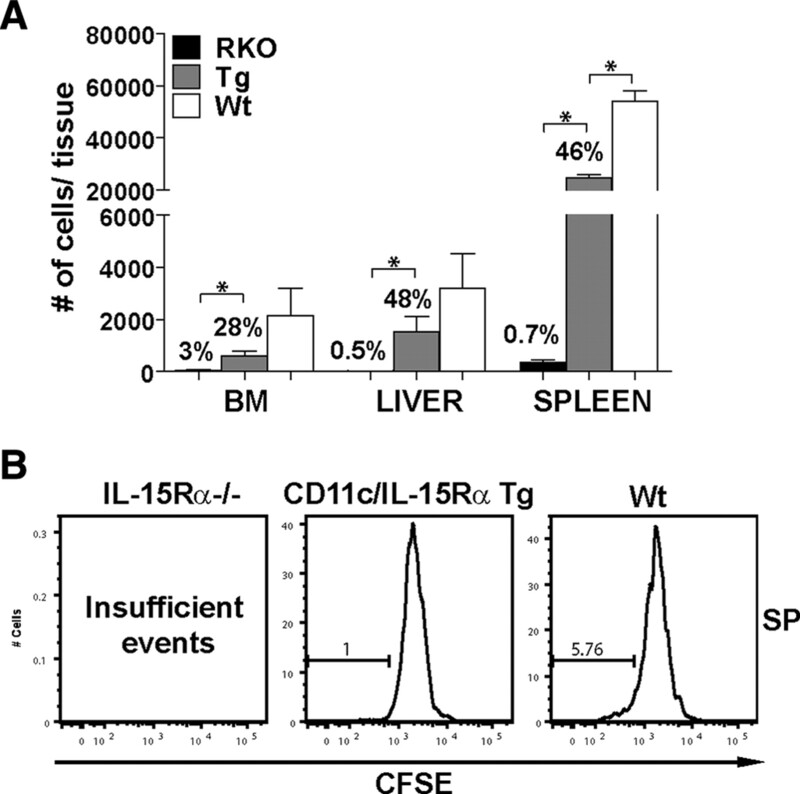 This effect was not observed so much in the spleen and liver of IL-15Rα−/− BM→Wt chimeras, suggesting that CD11c+ cells are the dominant hemopoietic cells trans-presenting IL-15 to NK cell in the periphery (Fig. 2⇑C). To exclude the possibility that donor-derived BM parenchymal cells were contributing to the effects we observed, the same scheme of generating BM chimeras was also performed using sorted lineage-CD45+ckit+Sca-1+ stem cells, and the same findings were observed (data not shown). Overall, the data suggest that CD11c+ cells predominantly trans-present IL-15 at the immature and M1 (CD11blow) differentiation in the BM and spleen and suggest other IL-15Rα+ hemopoietic cells drive the later events of NK cell differentiation. Stages of mouse NK cell development and maturation have also been distinguished by the regressive expression of CD27 and the progressive expression of CD11b with the earliest stage being the CD27+CD11blow, which gives rise to a CD27+CD11b+ population and eventually a terminally differentiated CD27lowCD11b+ subset (33). Therefore, we assessed the recovery of these three stages in the CD11c/IL-15Rα Tg mice. In our analysis of CD27 and CD11b populations in the BM, similar proportions of CD27+/CD11blow and the CD27+/CD11b+ cells were observed in the CD11c/IL-15Rα Tg and Wt mice, whereas the majority of the NK cells in IL-15Rα−/− mice displays a CD27+CD11blow phenotype (Fig. 2⇑D). Conversely, whereas all three populations were prevalent in the spleen of Wt mice, the CD27low/CD11b+ phenotype was deficient in the CD11c/IL-15Rα Tg mice (Fig. 2⇑D). This analysis suggests that IL-15 trans-presentation by DC is insufficient for maturation of CD27low/CD11b+ NK cells, which preferentially reside outside the BM. The findings above demonstrate IL-15 trans-presentation by CD11c+ DC subsets primarily act at the immature stage of NK cell development. During this stage, expression of numerous activating and inhibitory receptors (CD94/NKG2 and Ly49), which are important for NK cell licensing, are induced (8, 9). Although there is evidence that both IL-15 and IL-15Rα participate in the acquisition of Ly49 receptors (20), the cell type providing IL-15 for the transition to a Ly49+ population is unclear. Thus, the cell surface expression of various activating and inhibitory receptors by splenic NK cells was analyzed in IL-15Rα−/−, CD11c/IL-15Rα Tg, and Wt mice. NK cells from CD11c/IL-15Rα Tg and Wt mice, but not IL-15Rα−/− mice, expressed normal levels of the activating receptor Ly49H, as well as the inhibitory receptors Ly49G2 and Ly49 I (Fig. 3⇓, A and B). The inhibitory receptor, KLRG1, which is expressed in late stages of maturation (34) was also detected by NK cells derived from CD11c/IL-15Rα Tg and Wt mice (data not shown). Conversely, expression of CD94, NKG2 A/C/E, 2B4, and NKG2D was similar in the three groups of mice indicating that their acquirement is independent of IL-15 (data not shown). This data suggest that IL-15 trans-presentation by CD11c+ DC up-regulates the expression of the Ly49 repertoire on NK cells in vivo. DC drive Ly49 expression of immature NK cells. A and B, Expression of Ly49 activating and inhibitory receptors on splenic NK cells as detected by flow cytometry in Wt (top row), CD11c/IL-15Rα Tg (middle row), and IL-15Rα−/− (bottom row) mice. A, Histograms showing representative data from two independent experiments. B, Graph depicts the average percentage of the population that is positive for the indicated Ly49 molecule (n = 4/group). Error bar represent SE; *, p ≤ 0.05. C, In vitro acquisition of the Ly49 repertoire by BMDC. Ly49− NK cells were sorted from spleens of Wt mice and cocultured with DC generated from BM of either IL-15Rα−/− (left plot) or Wt (right plot) mice with GM-CSF. Plots show expression of Ly49 on NK1.1+CD3− cells at the end of coculturing. Data are representative of two independent experiments. D, Cell surface expression of Ly49 activating and inhibitory receptors by NK cells derived from Wt (top row) and IL-15Rα−/− (bottom row) BM donor cells. BM cells from Wt (CD45.2+) and IL-15Rα−/− (CD45.1/CD45.2+) were injected in equal proportions into irradiated CD45.1+ Wt hosts. After reconstitution of hemopoietic cells (∼8–10 wk later), the respective donor-derived NK1.1+CD3− cells in the spleen were identified based on CD45 isoform expression. Plots are representative of three experiments (n = 5 mice/group). To directly demonstrate that DC drive the differentiation of Ly49− NK cells into Ly49+ NK cells, we determined whether IL-15 trans-presentation by purified DC could drive this differentiation process in vitro. Therefore, Ly49− NK cells were isolated from Wt splenocytes by flow cytometric sorting and then cocultured with BM-derived DC from either IL-15Rα−/− or Wt mice. After a 5-day incubation period, NK cells cocultured in the presence of IL-15Rα+ Wt DC expressed the various Ly49 markers whereas NK cells cultured with IL-15Rα−/− DCs did not (Fig. 3⇑C), supporting our in vivo findings that DC-mediated IL-15 trans-presentation drives a specific differentiation event during NK cell development. To exclude the possibility that IL-15Rα expression by NK cells is required for Ly49 expression as suggested by previous studies (20), mixed BM chimeras were generated by injecting equal amounts of IL-15Rα−/− BM (CD45.1+/CD45.2+) and Wt BM (CD45.2+) into lethally irradiated congenic Wt mice (CD45.1+). After reconstitution of the hemopoietic compartment, the various Ly49 receptors (I, H, G2, and A/D) were expressed at similar levels by NK cells derived from either IL-15Rα−/− and Wt cells coexisting in the same mice (Fig. 3⇑D). This finding demonstrates that IL-15Rα expression by NK cells is not necessary for Ly49 up-regulation. Altogether, these findings reveal IL-15 trans-presentation is critical in the acquisition of the activating and inhibitory Ly49 receptors, and DC are capable of driving this specific differentiation event required for functional maturation. During NK cell development, expansion of successfully differentiated NK cells is an important component of NK cell development. Since IL-15 is known to induce proliferation (23, 26), we determined whether IL-15Rα+ DC affects cell expansion occurring during NK cell development. To examine this role, the amount of BrdU incorporation in the immature (NK1.1+DX5−CD3−) and mature (NK1.1+DX5+CD3−) populations was compared among the three groups of mice. No difference in the incorporation of BrdU was observed among immature NK cells located in the BM, spleen, and liver (data not shown). 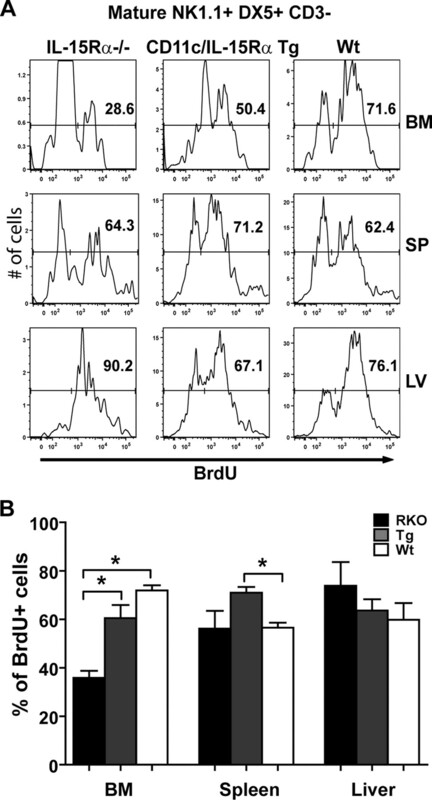 In contrast, BrdU incorporation was decreased in the mature NK cells from the BM of IL-15Rα−/− mice compared with Wt mice. Furthermore, IL-15Rα+ DC significantly recovered this deficiency in the BM (Fig. 4⇓). Mature NK cells found in the spleen and liver were not affected by the absence of IL-15Rα and IL-15Rα+ DC appeared only to have small but significant increase in BrdU incorporation in splenic NK cells (Fig. 4⇓). Collectively, the above data show the expansion of mature NK cells occurring in the BM is dependent on IL-15 trans-presentation and partially driven by CD11c+ DC. DC assist in the expansion of NK cells in the BM. A, Representative histograms showing the in vivo BrdU incorporation [3 wk of BrdU (0.8 mg/ml) in drinking water] as detected by flow cytometry in mature NK cells (NK1.1+DX5+CD3−) found in the BM (top row), spleen (middle row), and liver (bottom row) in the three groups of mice. B, Graph depicts the average BrdU incorporation of mature NK cells from the individual groups in two independent experiments (n = 4 mice/group). The highlight of NK cell development is the generation of NK cells that can mount an early immune response regulated by cytokine activation or down-regulation of self MHC class Ia (35). NK cells recovered by IL-15Rα+ DC display a phenotype that is associated with functional maturation (4). Since recent reports (30, 36) demonstrate that DC can activate NK cells via IL-15 trans-presentation, it is possible that Tg expression of IL-15Rα to DC could lead to aberrant NK cell activation. To examine the activation and functional status, NK cells were sorted from CD11c/IL-15Rα Tg and Wt mice and stimulated with plate-bound NK1.1 Ab or media alone (8). After a 5-h incubation period, the production of IFN-γ and cytolytic potential as determined by CD107 cell surface mobilization was analyzed (32). Similar to Wt NK cells, NK cells from the CD11c/IL-15Rα Tg mice produced IFN-γ and expressed CD107 only in response to NK1.1 stimulation (Fig. 5⇓A). In addition, the expression level of the activation-enhanced cell surface marker, CD69, by unmanipulated NK cells from the CD11c/IL-15Rα Tg mice was similar to Wt NK cells (Fig. 5⇓B). Taken together, our data suggest DC-mediated IL-15 trans-presentation during steady-state conditions does not activate NK cells but rather generates functionally mature NK cells. NK cells derived by DC-mediated IL-15 trans-presentation are functional but not activated under steady-state conditions. A, Effector function of NK cells. NK cells sorted from spleens of either Wt or CD11c/IL-15Rα Tg mice were incubated for 5 h in the absence (top row) or presence (bottom row) of plate-bound anti-NK1.1 Ab. Intracellular IFN-γ production and CD107 cell surface mobilization were measured via flow cytometry as indicators of effector function. Plot is representative of two independent experiments. B, Ex vivo comparison of the cell surface expression of the activation-induced marker, CD69, by splenic NK cells from Wt or CD11c/IL-15Rα Tg mice. After development is complete, maintenance of mature NK cells is predominately mediated by survival of NK cells, rather than by homeostatic proliferation, and is highly dependent on IL-15 trans-presentation (18, 23, 25, 26). Lymphopenia-induced proliferation of NK cells also uses IL-15 trans-presentation and has recently been shown to be mediated by DC (37). Whether DC also maintain the survival of mature NK cells via IL-15 trans-presentation under steady-state conditions has not been demonstrated. To examine the role of IL-15 trans-presentation by DC in NK cell homeostasis, splenic NK cells from Wt mice (CD45.1+) were labeled with CFSE and transferred into IL-15Rα−/−, CD11c/IL-15Rα Tg, and Wt mice (all CD45.2+). After 3 wk, the BM, liver, and spleen were extracted and analyzed for the presence of donor NK cells. In all tissues examined, the number of donor NK cells was severely decreased (between 0.5 and 3% of Wt levels) in IL-15Rα−/− hosts compared with that found in Wt mice highlighting the crucial role of IL-15Rα in NK cell survival (Fig. 6⇓A). In CD11c/IL-15Rα Tg mice, the number of donor NK cells was recovered to 46 and 48% of Wt levels in the liver and spleen, respectively. Examination of cell division via CFSE dilution indicated homeostatic proliferation did not occur during this time (Fig. 6⇓B), as reported previously (18, 25). Since recovery of donor NK cells was not as prevalent in the BM of CD11c/IL-15Rα Tg mice, it suggests that either mature NK cells do not migrate to the BM as efficiently as to the spleen or liver or that either CD11c+ cells in the BM do not provide survival signals to mature NK cells. Altogether, the data demonstrate that DC indeed participate in mediating survival of mature NK cells by trans-presenting IL-15. ), and Wt (□) mice. Error bars represent SE, and the numbers above bars represent percentage of Wt levels; *, p ≤ 0.05. B, Dilution of CFSE by donor cells found in the spleen of the three hosts. Plots are representative of two individual experiments (n = 4 for each group). Interactions occurring between DC and NK cells have typically been described in the context of an immune response (28, 38). For example, it has been reported that DC-mediated IL-15 trans-presentation activates NK cells both in vitro and in vivo (30, 36, 39). But whether DC also participate in NK cell ontogeny by providing IL-15 has not been described. In this report, we provide evidence that DC indeed participate in NK cell development as well as in the homeostatic maintenance of NK cells via IL-15 trans-presentation. Furthermore, we identify specific stages of NK cell development where IL-15 trans-presentation by CD11c+ and CD11c− hemopoietic cells preferentially occurs highlighting an important role for cell-specific IL-15 trans-presentation in NK cell functional maturation. BM stromal cells have long been regarded as the important cell-type controlling NK cell development (40, 41, 42, 43). Therefore, it may be unexpected that DC also mediate some of the functions previously attributed to BM stromal cells. Nonetheless, the previous studies examining BM stromal cells did not exclude the possibility that other cell types have overlapping functions. Confusion can also arise as a result of ambiguous and generic terminology used to define stromal cells. Although “stromal” is generally used to describe structural support cells, the more accepted definition regarding BM stromal cells refers to radiation resistant cells, which are believed to be nonhemopoietic. In contrast, others have described BM stromal cells as fibroblast-like cells that can be isolated from the BM but can reconstitute hemopoietic cells (44). More importantly, the conclusions made in our present study are based on the definition of BM stromal cells that was used in prior studies i.e., activity attributed to radiation-resistant cells in BM chimera models (40, 41, 42). Overall, our present study adds to these previous findings showing other cell types, which are CD11c+ can also provide IL-15 to NK cells during early events of development. We can only speculate as to why NK cells use IL-15 by both parenchymal and hemopoietic cells. The BM is an abundant site for hemopoiesis. Since parenchymal BM stromal cells are also involved in the development of other cell types such as B cells (reviewed in Ref. 45), it is possible that there is competition to receive resources from this cell type. Therefore, it would be advantageous for NK cells if they weren’t completely dependent on stromal cells for their IL-15. Second, IL-15 is up-regulated by TLR ligands (46, 47), which is a component of the adaptive response to pathogens. Since DC are very efficient in responding to TLR stimulation, DC may have evolved as the predominant cell type expressing IL-15. With time, the necessity for IL-15 to be stimulated by TLR was lost by DC, leaving this cell type as a promoter of NK cell development. In this present study, we specifically demonstrate IL-15Rα+ DC are efficient in driving the differentiation of immature and DX5+ NK cells (M1) and inducing acquisition of Ly49 expression while having a minor role in the transition of late stages of NK cell development (i.e., up-regulating CD11b and down regulating CD27). This role of DC at specific stages of NK cell development suggests that distinct niches of NK cell development likely exist in the BM. Because conventional DC are present in the BM at a low frequency and CD11c+ cells are a heterogeneous population containing CD11c+ plasma cytoid DC and DC precursors (48), the precise phenotype of the cells mediating these activities is not clear. In our hands, detection of cell surface IL-15 and IL-15Rα by CD11c+ BM cells is found by putative DC precursors but not plasma cytoid DC (S. W. Stonier and K. S. Schluns, manuscript in preparation). Thus, a cell type contained within the putative DC precursor population may be a DC subset mediating IL-15 trans-presentation. Despite the effectiveness of DC in providing IL-15 during the early stages of NK cell development, trans-presentation of IL-15 by CD11c+ cells alone was insufficient in mediating all the IL-15 events attributed to IL-15Rα+ hemopoietic cells, especially in the late stages of NK cell development. This finding highlights an unrecognized role for other CD11c− hemopoietic cells in NK cell development that may not have been previously identified; this may be because the late stages of NK cell development are not crucial for functional maturation but rather for mediating NK cell expansion. Identifying these other IL-15 trans-presenting hemopoietic cells involved in NK cell development may provide future insight on how best to improve NK cell expansion. In the peripheral tissues, the restricted expression of IL-15Rα to CD11c+ cells had less of an impact on recovery of normal NK cell numbers than in the BM. Because the effects of limiting IL-15Rα expression to CD11c+ cells was similar to that when restricted to all hemopoietic cells, we speculate that conventional DC are the predominate hemopoietic cells mediating IL-15 trans-presentation outside of the BM. On the basis of our data, the function of IL-15 trans-presentation in these peripheral tissues is more geared toward the homeostatic maintenance of NK cells. With the presence of precursors and developmental intermediates located in the peripheral tissues, it is possible that NK cell developmental niches can occur outside of the BM, but whether some residual differentiation occurs in these sites is still uncertain. The functional attributes of NK cells are greatly dependent on acquiring various activating and inhibitory receptors (8). The expression of these receptors, specifically the various Ly49 receptors, has been shown to be dependent on NK cells expressing IL-15Rα (20). In contrast, analysis from our Tg mice and the BM chimera models demonstrate that Ly49 expression is independent of IL-15Rα expression by NK cells. 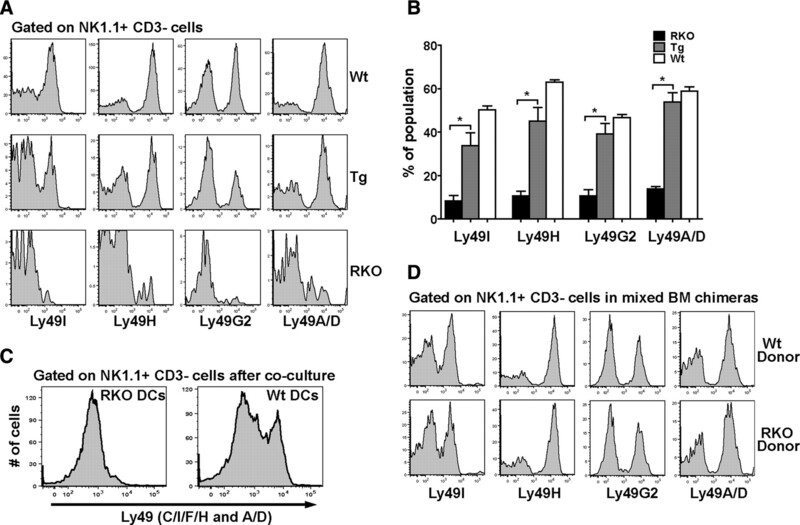 Past research has suggested that the addition of only IL-15 to NKp cultures drove the differentiation of NK cells; however, this differentiated population was negative for the Ly49 repertoire (49). The up-regulation of the Ly49 repertoire appeared by NK cells only in the presence of stromal cells and IL-15 (50, 51). These observations suggested that a cell-cell interaction was needed to acquire the Ly49 receptors, and IL-15 alone was not enough. More recently, Huntington et al. (52) revealed that although IL-15 provides survival signals to NK cells, the up-regulation of killer Ig-related receptors by NK cells was independent of such survival signals and dependent on IL-15 trans-presentation. Thus, we add new insight into the acquisition of the Ly49 repertoire by showing that DC-mediated IL-15 trans-presentation can drive this event previously shown to be mediated by BM stromal cells (50, 51); it also provides further support for the notion that IL-15 is essential in up-regulating the Ly49 repertoire. More importantly, since acquiring the various Ly49 inhibitory receptors is crucial in the licensing process, our findings demonstrate that IL-15 trans-presentation by DC participates in a crucial first step for this event. In addition to the early requirement for Ly49 expression, DC may directly mediate licensing as DC express the various ligands that interact with NK cell receptors (30). Interestingly, since it has been reported that IL-15 up-regulates MHC class I Ag-processing machinery in human DC (53), IL-15 may also be important for licensing by acting on the DC to promote the expression of ligands for Ly49. After licensing, expansion of maturing NK cells is an important late event in the developmental process. In our findings using transfers of mature NK cells, NK cell proliferation was not observed, which is consistent with previous studies showing maintenance of mature NK cells is mediated by survival (18, 25). However, since mature NK cells in the periphery were BrdU+, we reason that cell division occurred before exiting the BM. Since we observed that the numbers of late-stage mature NK cells and proliferation were deficient in the CD11c/IL-15Rα Tg mice, one could have suspected that licensing and/or functional maturation is incomplete. In addition, licensed NK cells are also believed to possess enhanced proliferation potential over unlicensed NK cells (8). However, since we demonstrate that NK cells from CD11c/IL-15Rα Tg mice have normal Ly49 expression and functional attributes, we believe these NK cells are functionally mature but have not received an adequate expansion signal. Overall, the minor loss in proliferation appears to be independent of NK cell licensing and possibly dependent on other IL-15Rα+ cell types. In summary, we have revealed IL-15 trans-presentation by DC contributes to the in vivo development and maintenance of functionally mature NK cells. Our data highlight an important concept that the developmental and homeostatic niche of NK cells is not only driven by IL-15 but by distinct IL-15Rα+ cell types that may be tightly regulated by the tissue microenvironment. This understanding of IL-15 trans-presentation by specific IL-15Rα+ cell types can assist in the quest to restore, maintain, or differentiate NK cells after adoptive transfer or BM transplantation. Thus, the identification of the cell types and the regulation of IL-15 trans-presentation by these cell types may offer an invaluable tool that will allow for the manipulation of NK cells in vivo. ↵1 This work is supported by National Institutes of Health Grant AI070910 and the M.D. Anderson Trust Fellowship (to K.S.). ↵2 Current address: Department of Infectious, Parasitic, and Immune-Mediated Diseases, Anti-Infectious Immunity Unit, Istituto Superiore di Sanità, Rome, Italy. ↵4 Abbreviations used in this paper: NKp, NK precursor; BM, bone marrow; DC, dendritic cell; Tg, transgenic; Wt, wild type. Ljunggren, H. G., K. J. Malmberg. 2007. Prospects for the use of NK cells in immunotherapy of human cancer. Nat. Rev. Immunol. 7: 329-339. Lanier, L. L.. 2008. Evolutionary struggles between NK cells and viruses. Nat. Rev. Immunol. 8: 259-268. Vosshenrich, C. A., T. Ranson, S. I. Samson, E. Corcuff, F. Colucci, E. E. Rosmaraki, J. P. Di Santo. 2005. Roles for common cytokine receptor γ-chain-dependent cytokines in the generation, differentiation, and maturation of NK cell precursors and peripheral NK cells in vivo. J. Immunol. 174: 1213-1221. Rosmaraki, E. E., I. Douagi, C. Roth, F. Colucci, A. Cumano, J. P. Di Santo. 2001. Identification of committed NK cell progenitors in adult murine bone marrow. Eur. J. Immunol. 31: 1900-1909. Huntington, N. D., C. A. Vosshenrich, J. P. Di Santo. 2007. Developmental pathways that generate natural-killer-cell diversity in mice and humans. Nat. Rev. Immunol. 7: 703-714. Fernandez, N. C., E. Treiner, R. E. Vance, A. M. Jamieson, S. Lemieux, D. H. Raulet. 2005. A subset of natural killer cells achieves self-tolerance without expressing inhibitory receptors specific for self-MHC molecules. Blood 105: 4416-4423. Haller, O., H. Wigzell. 1977. Suppression of natural killer cell activity with radioactive strontium: effector cells are marrow dependent. J. Immunol. 118: 1503-1506. Fehniger, T. A., M. A. Caligiuri. 2001. Interleukin 15: biology and relevance to human disease. Blood 97: 14-32. Lodolce, J. P., D. L. Boone, S. Chai, R. E. Swain, T. Dassopoulos, S. Trettin, A. Ma. 1998. IL-15 receptor maintains lymphoid homeostasis by supporting lymphocyte homing and proliferation. Immunity 9: 669-676. Kennedy, M. K., M. Glaccum, S. N. Brown, E. A. Butz, J. L. Viney, M. Embers, N. Matsuki, K. Charrier, L. Sedger, C. R. Willis, et al 2000. Reversible defects in natural killer and memory CD8 T cell lineages in interleukin 15-deficient mice. J. Exp. Med. 191: 771-780. Suzuki, H., G. S. Duncan, H. Takimoto, T. W. Mak. 1997. Abnormal development of intestinal intraepithelial lymphocytes and peripheral natural killer cells in mice lacking the IL-2 receptor β chain. J. Exp. Med. 185: 499-505. DiSanto, J. P., W. Muller, D. Guy-Grand, A. Fischer, K. Rajewsky. 1995. Lymphoid development in mice with a targeted deletion of the interleukin 2 receptor γ chain. Proc. Natl. Acad. Sci. USA 92: 377-381. Lodolce, J. P., P. R. Burkett, D. L. Boone, M. Chien, A. Ma. 2001. T cell-independent interleukin 15Rα signals are required for bystander proliferation. J. Exp. Med. 194: 1187-1194. Prlic, M., B. R. Blazar, M. A. Farrar, S. C. Jameson. 2003. In vivo survival and homeostatic proliferation of natural killer cells. J. Exp. Med. 197: 967-976. Koka, R., P. R. Burkett, M. Chien, S. Chai, F. Chan, J. P. Lodolce, D. L. Boone, A. Ma. 2003. Interleukin (IL)-15Rα-deficient natural killer cells survive in normal but not IL-15Rα-deficient mice. J. Exp. Med. 197: 977-984. Kawamura, T., R. Koka, A. Ma, V. Kumar. 2003. Differential roles for IL-15Rα-chain in NK cell development and Ly-49 induction. J. Immunol. 171: 5085-5090. Burkett, P. R., R. Koka, M. Chien, S. Chai, D. L. Boone, A. Ma. 2004. Coordinate expression and trans-presentation of interleukin (IL)-15Rα and IL-15 supports natural killer cell and memory CD8+ T cell homeostasis. J. Exp. Med. 200: 825-834. Schluns, K. S., E. C. Nowak, A. Cabrera-Hernandez, L. Puddington, L. Lefrancois, H. L. Aguila. 2004. Distinct cell types control lymphoid subset development by means of IL-15 and IL-15 receptor α expression. Proc. Natl. Acad. Sci. USA 101: 5616-5621. Minagawa, M., H. Watanabe, C. Miyaji, K. Tomiyama, H. Shimura, A. Ito, M. Ito, J. Domen, I. L. Weissman, K. Kawai. 2002. Enforced expression of Bcl-2 restores the number of NK cells, but does not rescue the impaired development of NKT cells or intraepithelial lymphocytes, in IL-2/IL-15 receptor β-chain-deficient mice. J. Immunol. 169: 4153-4160. Ranson, T., C. A. Vosshenrich, E. Corcuff, O. Richard, W. Muller, J. P. Di Santo. 2003. IL-15 is an essential mediator of peripheral NK-cell homeostasis. Blood 101: 4887-4893. Jamieson, A. M., P. Isnard, J. R. Dorfman, M. C. Coles, D. H. Raulet. 2004. Turnover and proliferation of NK cells in steady state and lymphopenic conditions. J. Immunol. 172: 864-870. Huntington, N. D., H. Puthalakath, P. Gunn, E. Naik, E. M. Michalak, M. J. Smyth, H. Tabarias, M. A. Degli-Esposti, G. Dewson, S. N. Willis, et al 2007. Interleukin 15-mediated survival of natural killer cells is determined by interactions among Bim, Noxa, and Mcl-1. Nat. Immunol. 8: 856-863. Degli-Esposti, M. A., M. J. Smyth. 2005. Close encounters of different kinds: dendritic cells and NK cells take centre stage. Nat. Rev. Immunol. 5: 112-124.
Cooper, M. A., T. A. Fehniger, A. Fuchs, M. Colonna, M. A. Caligiuri. 2004. NK cell and DC interactions. Trends Immunol. 25: 47-52. Mortier, E., T. Woo, R. Advincula, S. Gozalo, A. Ma. 2008. IL-15Rα chaperones IL-15 to stable dendritic cell membrane complexes that activate NK cells via trans presentation. J. Exp. Med. 205: 1213-1225. Stonier, S. W., L. J. Ma, E. F. Castillo, K. S. Schluns. 2008. Dendritic cells drive memory CD8 T cell homeostasis via IL-15 trans-presentation. Blood 112: 4546-4554. Huntington, N. D., H. Tabarias, K. Fairfax, J. Brady, Y. Hayakawa, M. A. Degli-Esposti, M. J. Smyth, D. M. Tarlinton, S. L. Nutt. 2007. NK cell maturation and peripheral homeostasis is associated with KLRG1 up-regulation. J. Immunol. 178: 4764-4770. Vivier, E., E. Tomasello, M. Baratin, T. Walzer, S. Ugolini. 2008. Functions of natural killer cells. Nat. Immunol. 9: 503-510. Lucas, M., W. Schachterle, K. Oberle, P. Aichele, A. Diefenbach. 2007. Dendritic cells prime natural killer cells by trans-presenting interleukin 15. Immunity 26: 503-517. Hochweller, K., J. Striegler, G. J. Hammerling, N. Garbi. 2008. A novel CD11c.DTR transgenic mouse for depletion of dendritic cells reveals their requirement for homeostatic proliferation of natural killer cells. Eur. J. Immunol. 38: 2776-2783. Andrews, D. M., A. A. Scalzo, W. M. Yokoyama, M. J. Smyth, M. A. Degli-Esposti. 2003. Functional interactions between dendritic cells and NK cells during viral infection. Nat. Immunol. 4: 175-181. Koka, R., P. Burkett, M. Chien, S. Chai, D. L. Boone, A. Ma. 2004. Cutting edge: murine dendritic cells require IL-15Rα to prime NK cells. J. Immunol. 173: 3594-3598. Ogasawara, K., S. Hida, N. Azimi, Y. Tagaya, T. Sato, T. Yokochi-Fukuda, T. A. Waldmann, T. Taniguchi, S. Taki. 1998. Requirement for IRF-1 in the microenvironment supporting development of natural killer cells. Nature 391: 700-703. Iizuka, K., D. D. Chaplin, Y. Wang, Q. Wu, L. E. Pegg, W. M. Yokoyama, Y. X. Fu. 1999. Requirement for membrane lymphotoxin in natural killer cell development. Proc. Natl. Acad. Sci. USA 96: 6336-6340. Wu, Q., Y. Sun, J. Wang, X. Lin, Y. Wang, L. E. Pegg, A. Futterer, K. Pfeffer, Y. X. Fu. 2001. Signal via lymphotoxin-βR on bone marrow stromal cells is required for an early checkpoint of NK cell development. J. Immunol. 166: 1684-1689. Roth, C., C. Rothlin, S. Riou, D. H. Raulet, G. Lemke. 2007. Stromal-cell regulation of natural killer cell differentiation. J. Mol. Med. 85: 1047-1056. Ogawa, M., A. C. Larue, C. J. Drake. 2006. Hematopoietic origin of fibroblasts/myofibroblasts: its pathophysiologic implications. Blood 108: 2893-2896. Nagasawa, T.. 2006. Microenvironmental niches in the bone marrow required for B cell development. Nat. Rev. Immunol. 6: 107-116. Neely, G. G., S. M. Robbins, E. K. Amankwah, S. Epelman, H. Wong, J. C. Spurrell, K. K. Jandu, W. Zhu, D. K. Fogg, C. B. Brown, C. H. Mody. 2001. Lipopolysaccharide-stimulated or granulocyte-macrophage colony-stimulating factor-stimulated monocytes rapidly express biologically active IL-15 on their cell surface independent of new protein synthesis. J. Immunol. 167: 5011-5017. Naik, S. H., P. Sathe, H. Y. Park, D. Metcalf, A. I. Proietto, A. Dakic, S. Carotta, M. O'Keeffe, M. Bahlo, A. Papenfuss, et al 2007. Development of plasmacytoid and conventional dendritic cell subtypes from single precursor cells derived in vitro and in vivo. Nat. Immunol. 8: 1217-1226. Williams, N. S., T. A. Moore, J. D. Schatzle, I. J. Puzanov, P. V. Sivakumar, A. Zlotnik, M. Bennett, V. Kumar. 1997. Generation of lytic natural killer 1.1+,Ly-49− cells from multipotential murine bone marrow progenitors in a stroma-free culture: definition of cytokine requirements and developmental intermediates. J. Exp. Med. 186: 1609-1614. Williams, N. S., J. Klem, I. J. Puzanov, P. V. Sivakumar, M. Bennett, V. Kumar. 1999. Differentiation of NK1.1+,Ly49+ NK cells from flt3+ multipotent marrow progenitor cells. J. Immunol. 163: 2648-2656. Roth, C., J. R. Carlyle, H. Takizawa, D. H. Raulet. 2000. Clonal acquisition of inhibitory Ly49 receptors on developing NK cells is successively restricted and regulated by stromal class I MHC. Immunity 13: 143-153. Huntington, N. D., N. Legrand, N. L. Alves, B. Jaron, K. Weijer, A. Plet, E. Corcuff, E. Mortier, Y. Jacques, H. Spits, J. P. Di Santo. 2009. IL-15 trans-presentation promotes human NK cell development and differentiation in vivo. J. Exp. Med. 206: 25-34. Tourkova, I. L., G. V. Shurin, G. S. Chatta, L. Perez, J. Finke, T. L. Whiteside, S. Ferrone, M. R. Shurin. 2005. Restoration by IL-15 of MHC class I antigen-processing machinery in human dendritic cells inhibited by tumor-derived gangliosides. J. Immunol. 175: 3045-3052.